There are a lot of genre film fans that hate Michael Bay movies. While some would call his brand of action dumb or assaultive, there is a very vocal fanbase out there that absolutely loves his work, including the Transformers film series. 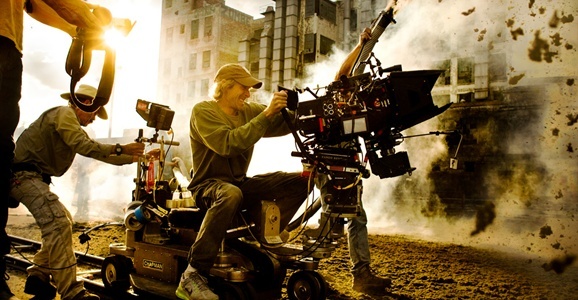 As we wait for the fourth installment in the series, sub-titled Age of Extinction, Michael Bay has addressed the film’s post-production progress and his critics. We are working hard cutting the movie right now. I think the first piece comes out for the Super Bowl and a teaser right after that. The Super Bowl will be held on Sunday, February 2, 2014, in MetLife Stadium in New Jersey. Considering February 2014’s movie releases, Age of Extinction‘s first teaser trailer might be attached to José Padilha’s RoboCop remake, which is due in theaters on February 12. It’s the only science fiction movie that is expected to bring in a big audience in the month of February, so the chances that the new Transformers teaser trailer will be attached to the remake are pretty good. No I did not ‘apologize’ for any Transformers movies. I did not say I shot the last three movies ‘less cool’ then [sic] the new fourth installment. I was talking specifically about camera style and tone, of the first movie compared to how I shot the new installment with a very big scale, cinematic style. I was very specific in saying the first Transformers was shot in a ‘generic suburbia’ area, not trying to be cool with any cinematic flashes. I wanted it to feel like this could happen in any backyard in the United States. I wanted the first Transformers to be very suburban and less cool, this is a much more cinematic one. I focused on keeping this one slick. There won’t be any goofiness in this one. We went a bit too goofy [on the last one]. It feels like a new chapter, this movie, but it’s not a reboot. This movie lives in the history of the Transformers movies, and this one starts three years after the last. It feels fresh. Age of Extinction follows an inventor named Cade, his teenaged daughter Tessa, and her boyfriend Shane, as they “discover a buried Transformer which sets the stage for the return of the rest of the Transformers.” The new film stars Mark Wahlberg, Stanley Tucci, Sophia Myles, T.J. Miller, Victoria Summer, Li Bingbing, Titus Welliver, and Kelsey Grammer. Transformers: Age of Extinction hits theaters everywhere on June 27, 2014, in 3D and IMAX. Read Michael Bay’s full blog post on his personal website. Well, he should apologize. Everything he touches blows up. just look at the end of this trailer.